Every year, confined space incidents result in worker deaths, injuries, and serious illnesses. Help protect workers using NFPA 350, Guide for Safe Confined Space Entry and Work. Confined space danger is widespread in all types of facilities -- from commercial buildings and hospitals to public works, utilities, and chemical/industrial facilities. By law in the United States, employers must comply with applicable regulations such as OSHA's 29 CFR 1910.146 and 29 CFR 1926 Subpart AA to ensure personnel safety. However, these regulations tell you what to d0 -- not how to identify, evaluate, and control confined space hazards or conduct rescue response. 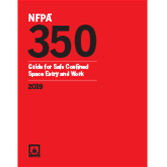 To fill the information gap, trust the 2019 edition of NFPA 350, Guide for Safe Confined Space Entry and Work. NFPA 350 is essential for anyone who enters confined spaces, along with facility managers, code officials, and safety personnel. NFPA 350 explains how to help protect workers who enter into confined spaces for inspection or testing, or to perform associated work. Provisions address the full range of special hazards, including those present in water treatment, petrochemical, and agricultural facilities. It provides information to assist companies that need to comply with OSHA's Permit-Required Confined Spaces (29 CFR 1910.146) among other standards. In addition, NFPA 350 helps fire service and emergency services personnel develop and evaluate plans for confined space rescue in conjunction with NFPA 1670, Standard on Operations and Training for Technical Search and Rescue Incidents. New information specific to construction activities as addressed in OSHA's 29 CFR 1926 Subpart AA, "Confined Spaces in Construction." New information pertaining to photoionization detectors (PID). PID are now widely available and used in combination with other atmosphere testing devices for assessing atmosphere hazards within confined spaces. First-time definitions for "engulfment" and "purging"
Make sure you are better prepared to recognize, evaluate, and control confined space entry hazards. 4.1 Identification and Documentation of Confined Spaces. 4.2 Identification of Confined Spaces During Construction. 4.3 Determination of Confined Spaces. 4.6 Identification of Spaces for Nonfacility Personnel. 5.5 Basic Requirements and Considerations. 7.2 Procedures for Atmospheric Monitoring. 7.4 Selection and Types of Monitors. 7.7 Personal Monitoring Versus Remote Sampling. 7.14 Acceptable Atmospheric Limits for Entry. 8.3 Controls for Other Identified Hazards. 8.4 Chemical and Atmospheric Hazards. 8.7 Portable Electrical and Mechanical Equipment Used in and Adjacent to Confined Spaces. 8.8 Bonding and Grounding for Flammable and Combustible Materials. 8.11 Slip, Trip, Ingress, Egress, and Entanglement Hazards. 8.14 Personal Protective Equipment (PPE). 9.3 Selection and Design of Ventilation. 9.6 LimitationsConsideration in Selection of Ventilation. 10.3 Hazard Evaluation and Risk Assessments. 10.4 Standard Operating Procedures (SOPs). 10.7 Confined Space Rescue Equipment and Gear. 10.10 Entry Rescue — Rescue Service Capabilities. 12.2 Responsible Person and Responsibilities. 12.5 Identification of Confined Spaces. 12.10 Personal Protective Equipment (PPE). 12.17 Reporting of Accidents or Near Misses. 12.18 General Fitness for Duty Evaluation. 13.2 Pre-Entry Evaluation and Permit Elements. 13.3 Reclassification and Alternate Procedures. 15.2 Responsibilities and Communication for Implementing MOC. 15.3 MOC Process and Activation. 15.4 MOC -Warranted Confined Space Changes. 15.5 MOC Completion and Verification. 16.4 PtD Process and Activation. 16.5 PtD Warranted Confined Space Changes. Protect workers from life-threatening hazards using first-time NFPA 350, Guide for Safe Confined Space Entry and Work. Every year, confined space incidents result in worker deaths, injuries, and serious illnesses. The danger is widespread because all facilities can have confined spaces -- from commercial buildings and hospitals to public works, utilities, and chemical/industrial facilities. By law in the United States, employers must comply with applicable regulations such as OSHA's 29 CFR 1910.146 and 29 CFR 1926 Subpart AA to ensure personnel safety. However, these regulations tell you 'what' to do, not 'how' to identify, evaluate, and control confined space hazards or conduct rescue response. To fill the information gap, NFPA introduces NFPA 350, Guide for Safe Confined Space Entry and Work. This all-new Guide is essential for anyone who enters confines spaces, along with facility managers, code officials, and safety personnel. NFPA 350 explains how to protect workers who enter into confined spaces for inspection or testing, or to perform associated work. Provisions address the full range of special hazards, including those present in water treatment, petrochemical, and agricultural facilities. It provides information to assist companies that need to comply with OSHA's Permit-Required Confined Spaces (29 CFR 1910.146) among other standards. In addition, NFPA 350 helps fire service and emergency services personnel develop and evaluate plans for confined space rescue in conjunction with NFPA 1670, Standard on Operations and Training for Technical Search and Rescue Incidents.